Easter Seals Louisiana is a non-profit, community-based health agency whose mission is to help children and adults with disabilities achieve independence through a variety of programs and services. Available services for children and youth with developmental disabilites. The Louisiana Children’s Health Insurance Program, or LaCHIP, provides health care to uninsured children up to age 19. It is a no-cost health program that pays for children’s hospital care, doctor visits, prescription drugs, shots and more. Learn more about what LaCHIP covers. Louisiana Office of Public Health genetics clinics provide services as genetic testing, counseling, education, treatment, and referral for those who have or are at risk for genetic disorders. Private genetics may offer services in your area. Please consult your physician. The Down Syndrome Association of Acadiana provides support to persons with Down syndrome, their families and friends through networking, promotion of positive public awareness, information sharing and advocacy. The Down Syndrome Awareness Group (DSAG) membership consists of parents, professionals and others concerned with Down syndrome. The group is a non-profit, tax-exempt organization governed solely by the members. • to work to promote social conditions that allow the full growth and potential of children and adults with Down syndrome and improve their quality of life. The mission of UP 4 DOWN’S OF SOUTHWEST LOUISIANA, INC. is to be a driving force in the Southwest Louisiana community in generating acceptance and belonging of individuals with Down syndrome. It is our strong desire to encourage a society in which people with Down syndrome can involve themselves in community activities and be assisted in their development of the skills necessary to do so. DSAGNO is a 501c3 support, information and advocacy organization. Through their membership, they provide support to new parents, self-advocates, family and friends of individuals with Down syndrome. Through their publications, web site, meetings and events, they provide the most current information to their membership and others interested in Down syndrome topics. Through their advocacy effort, DSAGNO members work to elevate the community's understanding of those issues so that children, youth and adults have the opportunities necessary to reach their full potential in all aspects of life. to support and connect families in Central Louisiana who have been blessed with a child or other family member who has Down syndrome, to encourage and support families who have received a prenatal diagnosis of Down Syndrome, and to promote AWARENESS, ADVOCACY, and ACCEPTANCE of Down syndrome in Central Louisiana. Up With Downs is a non-profit family support group dedicated to improving the lives and livelihoods of those with Down syndrome. We hope this site provides you with information and inspiration. We are an active group, with regularly scheduled meetings and events for our members. 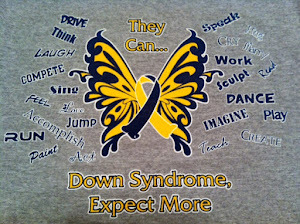 is a group that supports parents & families with individuals who were born with Down syndrome. They are committed to creating positive change for the future of their loved ones. MAY be born with Down syndrome & supporting parents who choose to adopt children with Down syndrome. They are committed to educating the general public on the FACTS about Down syndrome. Their group is continuing to grow as they reach out to theiur communities to promote the value, awareness, acceptance and inclusion for our loved ones born with Down syndrome! who could benefit from their group in any way. Northshore Families Helping Families is a family-driven resource center that serves the greater Northshore area. In 1989, the Louisiana legislature enacted the Community and Family Support Act in response to a grassroots effort by parents seeking resources for their children with disabilities. In 1992-1993, Families Helping Families resource centers opened around the state. The centers are unique to Louisiana. Every staff member in our office has a family member with a disability, or is a self-advocate. In addition, a majority of our board members must have a family member with a disability. We serve individuals with disabilities throughout the lifespan, from initial diagnosis through adulthood. Mission: The Arc of Louisiana advocates with and for all people with intellectual and related developmental disabilities and their families so that they shall live to their fullest potential.